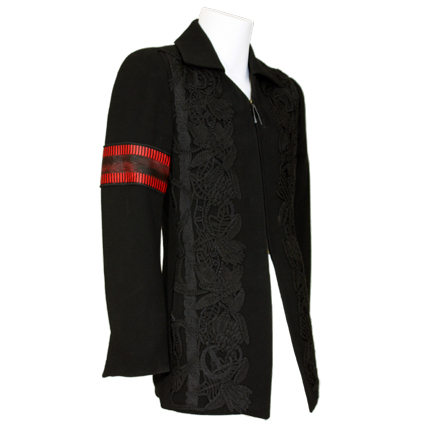 Custom Jacket worn on German television show "Wetten, Daas..."
This black jacket was worn by legendary performer Michael Jackson during an interview on the popular German entertainment program “Wetten, dass ..?” (Wanna Bet?) on March 20th, 1999. 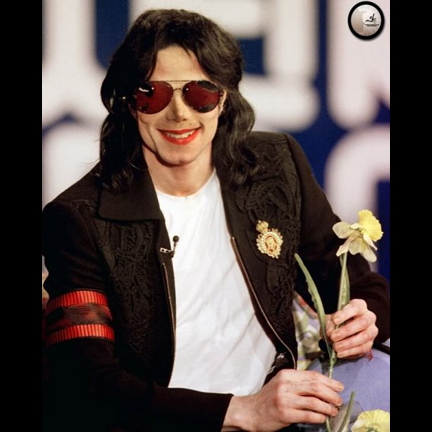 Jackson had performed live on the show in 1995, and appeared on the show in 1999 to talk about his project “Michael Jackson & Friends”, a benefit concert series with proceeds going to “Nelson Mandela Children’s Fund”, the Red Cross and UNESCO. The audience reaction to Jackson was so intense that neither Jackson nor Gottschalk could speak for several minutes, and were constantly interrupted once the interview was underway. After the interview, Jackson approached the screaming crowd, asking for some of the banners fans had made as Gottschalk tried in vain to get him to walk off stage, apparently afraid that security would not be able to contain the crowd. 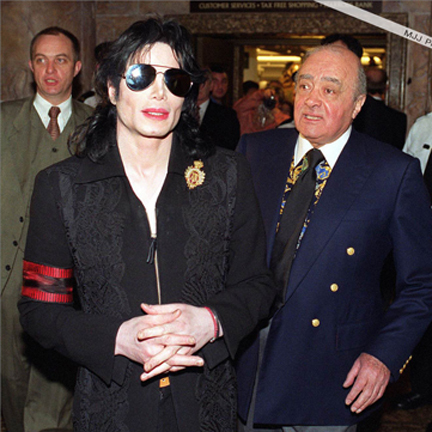 Jackson also wore the jacket during a trip to London in April of 1999, as he visited the famous Harrods department store and the Fulham Football Club with friend and host Mohammed Al Fayed the owner of both Harrod’s and the football club, and father of Dodi Fayed, the boyfriend of Princess Diana. 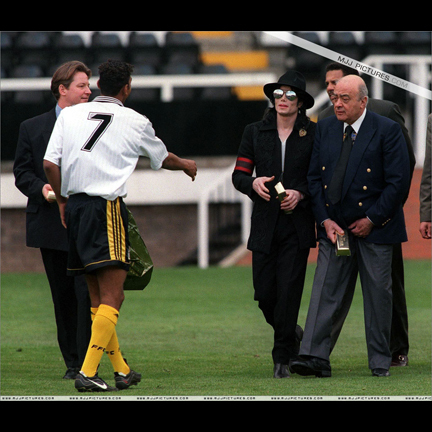 Photos of Jackson wearing the jacket were taken with Al Fayed as they walked on the pitch and shook hands with the football players, and as Jackson wrote autographs for fans outside of a gate. Jackson stayed to watch a match at Craven Cottage. A video of his visit can be viewed on YouTube. 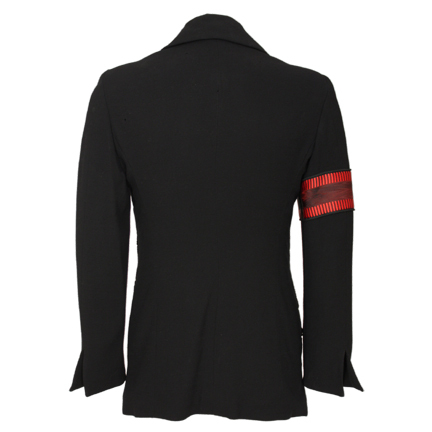 The black fitted zip-front jacket is made of wool crepe with long sleeves, wide collar with no lapel, and open cuffs. 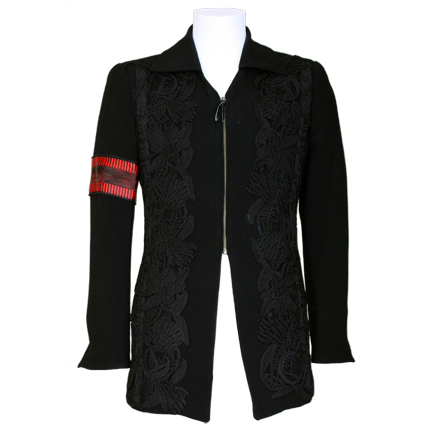 Both front sides of the jacket have heavy soutache braid passementerie in a floral design, and a woven red and black moiré band is stitched to the upper right sleeve. 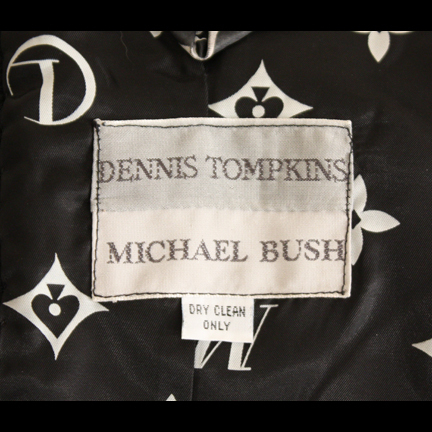 Sewn into the interior of the jacket is a “Dennis Tompkins” and “Michael Bush” designer label, the two-man designer and stylist team that created and implemented Mr. Jackson’s look and image for the past 25 years. 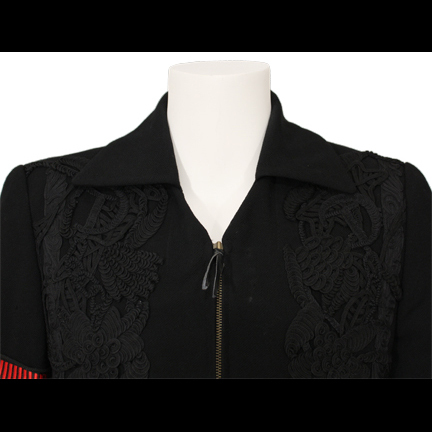 This jacket is an excellent example of Jackson’s later style and will make an impressive addition to any collection of high profile music memorabilia.